About a tight knit team with a passion. A management consulting firm, providing business advices to startups and young enterprises. We operate at the intersection of fashion and technology industries. As Fashion Technology Accelerator Milan, we are part of an international network. In 2012, the first FTA office was opened in Redwood City, in the heart of Silicon Valley, founded by a group of fashion and technology entrepreneurs with 25 years of experience in the industry. In 2013, after a year of rapid growth, we decided to expand globally, setting up two additional offices, in Milan and Seoul respectively. In 2018, we have been selected by Hatcher + as their global partner to invest in fashion technology startups. In Milan, we collaborate closely with FTA Seoul that provides expertise in accessing emerging markets. Being highly industry-specific and having an international reach, we can provide the best acceleration consulting for fashion tech startups, assisting our clients in all aspects of achieving growth and valorization of their companies. Paolo has been a member of the boards of investment companies, banks, and fund management companies. A former Executive Manager of important Italian banks, including Banco di Napoli and Banco di Sicilia, in addition to CEO of Diners Club Europe, Paolo is the Founder and CEO of Captha, which provides training in the banking and financing sector, and Novenero, a corporate finance advisory company. He has a degree in Economics from the University of Siena. Giusy has 10 years experience in the investment and startups area. She has been Investment Manager at Italian Angels for Growth, business angels network with 14M€ invested. Previously, she was innovation specialist at in Intesa Sanpaolo bank, running a program which supports business development of tech start-ups. Earlier, she had working experience in the United States working first as Researcher at the Kauffman Foundation then at the Mind the Bridge as coordinator of the incubation program in San Francisco. She has also been involved in consultancy projects to develop entrepreneurial ecosystem in different countries. She is lecturer at the major Italian Fashion Schools such as Istituto Marangoni and Domus Academy. Marco has in-depth expertise in data analysis and project management, having worked with companies from early-stage startups to medium sized international businesses. He has been the Project Manager for an Italian business plan competition (Start Cup Milano Lombardia) dedicated to early stage startups and has experience in management consulting, primarily working on data analysis and business development with SMEs and startups. He is a lecturer at fashion institutions such as Domus Academy and Istituto Marangoni. He is also the co-founder of Activators Pavia, an association of tech and business enthusiasts promoting innovation at all levels. Francesco has 12+ years of experience in sales and marketing, focusing especially on sportswear and streetwear. He is the founder and Senior Digital Strategist of the web lifestyle project strettoblaster.com and has been the Managing Director of the Italian branch of Marc Ecko for 6 years. He has also worked as Country Manager for New Era Cap, and for Nike’s branding activities. Fashion Technology Accelerator has built its advisor board consisting of executive profiles who are experts in the fashion, technology and entrepreneurship sectors. The board also states the important relationship between FTA and the corporate world. The board will be able to provide greater skills, capabilities and critical eye during the operations of recruiting and selection of promising new startups. Born in 1971, after his university education and the international experience Ercole joins Reda, which is now at the fourth generation, and from 2005 he took the responsibility upon himself becoming the new ceo of the wool factory. During the early years he held different positions: from production to marketing, from new business to design where he has learnt all the details of this job. Strongly attached to his region, like Reda’s woollen fabrics, he would like to improve the idea of an ethical factory, strongly connected to the quality of the product and, at the same time, to the respect of the human relationships, of the environment and, last but not the least, of the tradition. All these elements let Reda’s brand strengthen its position in the world market, becoming today synonymous of luxury and made in Italy. Gabriele Tazzari leads Research & Development at YOOX NET-A-PORTER GROUP. He is in charge of product evolution strategy and innovation adoption, focusing particularly on product design and personalisation, apps, mobility, rapid prototyping techniques and technology organisation. Tazzari began his professional career at Nexus as Area Manager and in 2000 joined YOOX S.p.A. as Chief Technology Officer (CTO) for the then nascent business. As CTO, Gabriele built and grew the Technology capacities leading a team of several hundred technologists, setting the baseline of the global e-commerce platform covering Europe, US, Japan and China. From 2011, he started focusing on Innovation as Governance and Innovation Director, working on software performance, scalability, automation and governance models to support the fast-paced growth of software applications and infrastructures. He took on his current role in 2015 and joined the Advisory Board of Fashion Technology Accelerator Milano in January 2018. Tazzari graduated in electronic engineering from Alma Mater Studiorum – University of Bologna. Giuseppe Miroglio is the President of the Miroglio Group. He has been the CEO of the group from December 2006 to July 2013. He is also the President of Miroglio Textile, Vice-President of Miroglio Fashion and of the Joint Venture Ayaydin-Miroglio. He has started his career in Miroglio in 1997 in London, supervising the activities of Miroglio Fashion UK. During this period he has personally contributed to the development of the sales network of Miroglio, strengthening business ties with the most important department stores of the UK. Two years later, he has become part of the Board of Directors of Miroglio S.p.A. In 1999, he has started the development of the retail activities of Elena Mirò, one of the most prominent brands of the group. In 2003, he has become the Managing Director of Miroglio Fashion, focusing his attention on the brand strategy of the company brands’. He is currently a shareholder and part of the Board of H-Farm, RCR Cristalleria Italiana, Egea and APRO. He was born on the 4th of April in 1972 in Turin and he has graduated in Business at the Cattolica University in Milan. Widely known as H., she is a well-recognised brand advisor and strategic consultant, bringing out the best of companies’ key assets, shaping them to better fit the present and future. She starts her career in the financial world passing through the fundraising and non-profit sectors, then landing in the luxury industry. She also worked as Head of Operations for the luxury concierge company Quintessentially and as PR in companies worldwide. Marco Palmieri starts his career in IT while still an engineering student and at the age of twenty he founds Mediacom, a company specializing in optical and computer systems applied to process controls. In 1987 he starts Piquadro and, after ten years’ production on behalf of prestigious Italian brands, he decides to dedicate himself to leatherware by creating the Piquadro brand and launching it on the Italian market. In 2007 he oversees the placement of Piquadro shares on the Italian Stock Exchange, where they are still listed. In 2016 he signs the acquisition of the Florentine leather goods brand The Bridge, creating a Group of around 100 million euros in turnover. Marco Palmieri’s great sensitivity for the discovery of new talents drives him to create in 2005 Piqubo S.p.A, an investment company that is mainly involved in financing new entrepreneurial activities. With the same purpose, in 2017 Palmieri launches Piquadro MyStartup Funding Program, an open innovation project which promotes innovation and enterprise by rewarding the best business ideas in the area of technology applied to the luggage and fashion accessories industry and rewards the best business idea with 100,000 euros and an acceleration path in Silicon Valley. Stefano is CEO and co-founder of Milano Investment Partners SGR, the first venture growth / expansion capital fund focused on Italian scale-up companie. He is co-founder and former CEO of U-Start, a consulting firm offering services to private investors, family offices, HNWI and corporates. The company create club deals through private investors. Stefano is also advisor of many startup around Europe and collaborates with various Early Stage VC Funds in Italy, UK, Switzerland and Germany. He has also dealt with strategy consulting and international marketing with a specific focus on the digital and renewable energy sectors. He has created the widest accelerator network in Africa during his collaboration with ALTIS. Our dedicated network of mentors and experts is here to help. From fashion to technology, from finance to investments, every aspect of the life of a startup is fully covered. Meet your next advisors here. 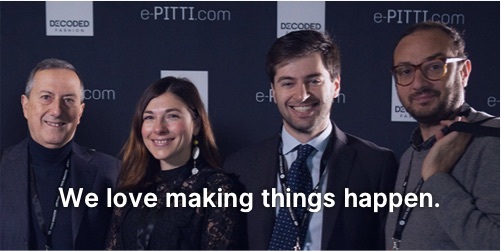 As Head of Marketing, Communication & Digital of e-PITTI.com, Anna coordinates the digital and marketing strategies of the Online Fairs Project of Pitti Immagine including the business development activities related to it. After graduating in Foreign Languages for International Communication, living between Italy and Spain, she developed a career of 7 years working in the Digital and Communication Department of Benetton Group, covering both corporate and product communication for its brands. She then brought those skills to Pitti Immagine and FieraDigitale taking on the continuous development of the fairs’ digitalization for one of the leading fashion trade show realities globally. Andrey has 15+ years of experience in product design, hardware, and innovation technology. He is the Co-Founder and CEO at ELSE Corp, a virtual retail company. He has been the Business Intelligence Manager for Zero9 and the CTO of “Moda e Tecnologia”. Ishwari is the Fashion Tech Project Officer at Centre for Fashion Enterprise, London’s pioneering fashion business incubator. She has 9+ years of experience in design, styling, branding, digital marketing and social media, from hi-end fashion and tech startups, non-profits, SMEs, to high street and luxury lifestyle brands. She currently runs CFE’s fashion tech acceleration programmes & events while focusing on creating a thriving fashion technology ecosystem in London. Mary built up her expertise in Marketing and Communications mainly working for sports and sportswear brands such as Nike, Fila, Torino 2006 and adidas. While at adidas, she covered the role of Head of Brand Marketing, giving a crucial and increasing role to Digital & Social Media; she later transitioned to Marketing Operations and Business Development, re-designing and coordinating the go-to-market process for South Europe. Mary has past and current experiences with start-up companies both in technology and design furniture. Salvo has been a Professor of Strategy, Management & Technology Department at Bocconi University and Strategic Department at SDA Bocconi, since 1981. Since 1992 until 2013 Founder and Director of Fashion & Luxury Knowledge Center, SDA Bocconi. Since 2008 until 2013 Scientific and Board Executive Director (General Management & Corporate Relations) at Milano Fashion Institute. Independent Board Director at Reda1865 (Wool Fabrics). Partner and Board Director at 1TrueID (IoT). Founder and Ceo at SINAPSI, Management consultancy in Fashion & Beauty. Author of many articles and books, among others: “The Strategic Management of the Fashion Companies”, Etas, 2002; “The Responsible Fashion Company”, Greenleaf, 2015. Chief Marketing and Communications Director with proven experience gained in Luxury, Fashion, Beauty, Art, Retail and Lifestyle for companies including Superga, Trussardi, Salvatore Ferragamo and Value Retail. Excellent knowledge of international strategy, business organization and management, business plan and income statements, brand positioning and management, marketing and integrated communication, licensing, fashion retail and cool hunting. Author of the book The Luxury …. Magic & Marketing – Present and Future of Essential Superfluous (Ed. Franco Angeli – 5 editions: 2006, 2007, 2008, 2013, 2015). Gabriele has spent 35 years in the fashion world in industrial companies covering roles from the commercial director till the managing director. His last experience in China has completed the wide experience in international fashion business. He invested in the chinese market because he guesses the italian companies need an italian high profile culture and professionality to support their activity in this part of the world following the great change of this country. Simone has 10+ years of experience in IT and has mostly worked with API and developers’ platforms for companies across Europe and USA. He is currently the CEO at Marketcloud, backend as a service for e-commerce applications. Not the tipical dev, due to his activity, he’s able to setup digital strategies for development and go to market of new projects. Matteo has 10+ years experience in the digital design world with a special focus on branding and user experience. He is co-founder of the web agency glueglue™ and the multimodal transport platform Waynaut. He works with companies from various fields, from the ICT to the food and beverage to the arts and culture. Francesca has 15+ years of experience in the digital landscape, having covered projects from e-commerce to e-learning. She has been working for Google for 10+ years and is currently involved in the Google Digital Academy team, working closely with brands in order to improve their digital customer relationships. Asaf co-founded Fit-Analytics, a Berlin based Fashion/Tech start up that helps online shoppers identify which size will fit best. Over 100M users shop now with confidence on sites as Asos, The North Face and Puma. Currently, Asaf is leading SodaStream’s direct initiative. Fabian has 10+ years of experience in branding and user interface design. He co-founded glueglue™ in 2006, a web design and communication agency specialized in branding. He also works as an associate and mentor in startups like Flower Burger® and Waynaut, taking his knowledge from product design and applying it to print design and web interfaces. Ingersoll Rand board of director member, Alessandro has 15+ years experience in Finance within manufacturing, logistics and food industry companies such as Heinz, DHL Express, Ingersoll Rand and Accenture operating in different European countries. He is specialized in new product development, investments analysis, due diligence and budgeting. Alessandro holds a Bachelor degree in economics from the University Cattolica, Milan as well as Executive Master degree from SDA Bocconi, Milan. He is also a co-founder of MyriJoy™, start-up specialized in production and sales (eCommerce) of patented art mosaic kits. Tony is the Head of Innovation Promotion at Intesa Sanpaolo. He has 20+ years of experience in the marketing world, having worked as Director of Communications in I.NET, Kataweb, and Inferentia. He has also been Marketing Director of Burson-Marsteller, Partner and Managing Director of GAS Communication, as well as Quintessentially Italy. Marie-Pierre is the Business Cluster head and founding Program Leader of the Master in Luxury Brand Management in Domus Academy. Her 20+ years of experience span from Management Consulting, to Strategic Marketing & Branding and Post Graduate Education. Design-thinking, customer empathy, actionable insights and business viability are her mantra. Her widely transversal background makes her at ease both in highly strategic and operational contexts and in a wide range of lifestyle industries, among which luxury and fashion. Alessandro has 10+ years of experience in online media, marketing, and communication projects, with a strong focus on luxury, digital communication, e-commerce, and digital strategies definition. He is the ‎Global Digital Communication Manager at Woolrich and actively collaborates with leading universities on topics such as brand strategy, design, and advertising. Lara has worked for 10+ years for leading fashion brands such as Kenzo, Bottega Veneta, Alexander McQueen, Valentino, and Versace, dealing with accessories licensing, marketing, and communication strategies at an international level. Andrea has 20+ years of experience in digital marketing in luxury industry. He is currently the WW Communication and Marketing Director at Gilmar. He has also been Global Head of Digital, Ecommerce & CRM at Trussardi and Head of Global Corporate Digital Marketing in Tod’s for several years. Daniela has 15+ years of experience as Brand & Merchandiser Manager, Licensing Manager, and Brand Strategist in Dolce & Gabbana and in Gianni Versace. As a consultant she has developed tailored strategies in retail, as well as implemented business development activities for the launch of new products. Global Digital, E-commerce & CRM Director at KIKO Milano. Startup & blockchain / crypto advisor and investor. 15 years of international business experience between Europe and Asia (12 years lived in Asia). Responsible for defining and implementing KIKO Milano global Digital, ecommerce, social and CRM strategy. Aiming at building a comprehensive omni-channel customer experience, with expertise ranging from e-commerce business development, off and online media strategy, off and online CRM integration to in-store digital projects and digital organization and evangelization. Entrepreneur-minded, he also founded several start-ups and continues to act today as an angel advisor and investor in start-up companies, and accelerators incubators (EGI Booster / Barcelona, TheFamily/France, Angelvest/Hong-Kong, China). Gabriele has 10+ years international experience in Consulting (Accenture), Yachting (Azimut Benetti) & Luxury Retail (Kering Group). Naturally passionate about innovation, after his MBA he joined the Kering Group, working within the WW Retail teams of Bottega Veneta (first) and Brioni (currently) to expedite their digital transformation at the intersection of business & technology. He also serves as equity partner of iStarter. Julien has 15+ years in the sportswear and streetwear business, having worked internationally between Europe, Asia and U.S., with a deep knowledge of trends and product development. Julien has worked for brands likes Sir Benni Miles, Zoo York, Marc Ecko, Avirex. Asli Ozbek is a consultant and trainer specialised in fashion and retail. Asli’s experience spans over 12 years, working on product and retail management in luxury brands such as Louis Vuitton and Lanvin Paris. Having studied fashion merchandising in Polimoda and Organizational Psychology in Insead Business School, Asli blends a coaching approach with extensive industry knowledge. Asli currently lives between Milan and Istanbul and works as a consultant for fashion start-ups and a career coach for fashion professionals. Graduated in Mechanical Engineering (MSC) with an MBA, Carlo has more than 20 years of experience; he has developed a strong expertise in the Management of Fashion Business as CEO with a solid base in Operations Management the Function he started from. He experienced different situations from Start-up, to TurnAround and Restructuring. Jarvis has 15+ years of experience as a journalist and digital communication consultant. He has been the Global Digital PR Manager of Tod’s for 3 years and is currently the Head of Digital at Pinko. He’s the author of “Luxury 2.0, the new digital strategy of luxury brands” (Lupetti Edizioni – 2010) and “Luxury 2.0, digital evolution” (Lupetti Edizioni – 2013). Simone has over 15 years of international, cross-industry experience in digital transformation. He co-founded several startups, including FashionBI in Hong Kong. Over 10 years of service design experience, defining successful product strategies and developing business opportunities. He has been Director of Product & Marketing and member of the Leadership team @ Cerved Group for 5yrs. He is now Managing Director of Cerved ON_ Marketing Services. Anna is a fashion designer and the Head of the Fashion Cluster at Domus Academy. Before that she was in Singapore for 4 years where she worked as the Head of the School of Fashion and Design at MDIS. Anna received a Ph.D. in Design (Textiles) from Politecnico di Milano with a project in collaboration with Loro Piana. She co-founded the brand IL SISTEMA DEGLI OGGETTI. Licia and Francio are fashion designers in charge of two proprietary brands, L’F Shoes and Licia Florio, for which they ideate and create the complete line of products sold on ilflor.com. They have a strong background in fashion, art, and internet marketing, actively collaborating as consultants for product development, Art Direction, and communication strategies with major companies in fashion. Gianluca M. Girard is the E-commerce General Manager at ALGHANIM INDUSTRIES with responsibility of P&L and end-to-end digital on line business in Kuwait and Kingdom of Saudi Arabia. Prior to joining Alghanim Industries, Gianluca worked as e-commerce director at several companies, including TALLY WEiJL (Switzerland), GUESS (Switzerland) and BVLGARI (Italy, US). Notable is his global experience of 20+ years in E-commerce and Internet, including the responsibility of New Technologies (Bvlgari) after his initial career with Accenture. Industry ties to make you stronger. Ranging from fashion to technology, we are able to oversee and advise on almost every aspect of the strategic development for a startup. We have solid and reliable partners across several industries, because we don’t play solo, but we play hard. e-PITTI.com is a project of Pitti Immagine, launched in June 2011. It hosts the digital version of Pitti Uomo, Pitti W, Pitti Bimbo and Pitti Filati. The platform, created by FieraDigitale, is a professional and innovative tool which maximizes the potential of trade shows always accessible from anywhere around the world. It provides an online stand where exhibitors can present collections, trends and products to international buyers certified by Pitti Immagine. It is a tool for acquiring, profiling and developing visitors’ database as well as an incentive for companies for new business and contacts opportunities. DF mission is to expose the fashion community to new ideas, demystify technology and foster creative partnerships between tech startups, designers, retailers and media professionals in highly interactive summit formats. Events include top-level speaker session, live demonstrations, hackathons, mentorship sessions and fashion startup competitions in New York, London, Tokyo and Milan. Fashionbi is the world leader in business intelligence for the fashion industry. They forecast, analyze and report performances of brands, their benchmarks and client perceptions in 90 countries. Through the biggest database of brand performances, worldwide availability and a passionate international team of analysts, Fashionbi connects the dots behind the data, enabling smart decisions for improving and optimizing marketing efforts. Re:Tech started as a meetup group in Tel Aviv, in May 2013. since then, they grew into a community of over 1,500 members, bringing together entrepreneurs, investors, bloggers, brands, designers and everyone else interested in fashion innovation. Greatcontent is a web content provider supporting e-commerce and digital companies in the creation and localization of SEO-optimized content. Stentle is an Omnichannel Commerce Platform (SaaS) optimized for the Fashion industry that allows companies to build exceptional customer-focused experience. With Stentle, Fashion Brands, Designers and Retailers can realize a wide range of initiatives from standard single-store e-commerce to 100%marketplace platform or from mobile commerce apps to multi-sided platforms. Key distinctive features are: catalog optimized for Fashion, flexible and rich product page presentation, 1-step checkout process, geo pricing, advanced RMA, product collections, outfit builder and multi-merchant marketplace. Stentle allows all possible business models (B2C, B2B, B2B2C, C2C and C2B) and is Internet of Things Ready, that means it’s possible to set up customer journeys that develop across beacons, RFID tags, Wi-Fi captive portals. Cippest is a web agency qualified in creation, optimization and management of e-commerce. Prestashop is the platform of choice from 2010. This path places today the company among the firsts in Italy and Europe for competence and expertise in the management of this fantastic open source. Penguinpass is an access management system for events with specific solutions for the fashion world. Created and clipped to the needs of both the organizers and guests, this revolutionary system allows the users to live a new and exclusive experience. Unlike other systems Penguinpass provides a dynamic list that can recognize guests waiting to access without having to ask them the name, an experience of extraordinarily innovative welcoming. Thanks to the integrated system for the recognition of the presence the event management is done in real time, controlling flows within the location and ensuring the security that the guest is really who you are waiting for, one essential tool to limit the number of “unwanted presences”. At the same time the guests app allow them to manage invitations with simple clicks and be guided step by step towards their seating or points of interest in the event. VSeen is a Visual Search Engine that can analyze and identify colour, shape and pattern of the clothes inside images. 1. E-commerce visual tools: Recommendation System, to suggest the most combinable products or similar ones. Search Engine. To allow products across categories to be found by similar colour, pattern or shape; without using any metadata. Inventory Manager, save you time and money, treducing tagging activity end error caused by mistakes in metadata inserting. Auto-tagging, auto–classification, duplicates detector. 2. Trend Analysis Platform to discover the preferences of social networks users on colours, shapes and patterns, understand their preferred items and their opinion on your products (Sentiment Analysis), identify influencers and track marketing campaign. 3. Anti-counterfeiting Service. To identify unauthorized e-commerce and fake products sold on other marketplaces like eBay or Etzy. Siteimprove transforms the way organizations manage and deliver their digital presence. Unlock new insights to gain complete visibility across your content quality, performance, and visitor behavior. IAG is the largest business angels network in Italy, with more than 120 members. The investment focus is on seed stage startups and the investment size is between € 200.000 and € 800.000. Through its members and co-investors, IAG has invested more than € 24M, contributing to the growth of 28 innovative startups. Tech Silu is promoting the creation of a seed fund for Italian startups, building the first cross-continental demo day to match Chinese and Italian communities. Tech Silu selects the best Italian startups which have great attractiveness for Chinese investors. Today Marangoni Institute is an established and recognized aesthetic laboratory of European-style culture with a specifically Italian imprint. Working with the most interesting names in fashion and design, teachers are able to pass on their expertise to train the excellence of tomorrow’s industry professionals, enabling them to contextualize classroom learning in the realities of the marketplace. The path includes constant contact with the best companies in fashion and design, who look to the Istituto for new individuals to work in their companies. VENTE-PRIVEE, THE EUROPEAN E-COMMERCE LEADER, IS THE PRODUCT OF A CONSTANT PROCESS OF INNOVATION THAT HAS ALWAYS DRIVEN OUR BUSINESS. To keep breaking the mould in its preeminent sector – fashion – vente-privee is opting for open innovation to support the growth of the best European start-ups that are creating new on- and offline consumption patterns for tomorrow’s fashion. The vente-privee accelerator, an initiative originally developed by Jacques-Antoine Granjon and his team, is part of an ambitious R&D plan that aims to assist and spur changes in e-commerce. Skolkovo Foundation is the principal agency responsible for the Russian Skolkovo Innovation Center, a scientific and technological centre for the development and commercialisation of advanced technologies. It is a non-profit organization founded in 2010 and charged by Russian President Dmitry Medvedev with creating a new science and technology development centre in the Moscow suburb of Skolkovo. The Skolkovo innovation system comprises the Skolkovo Institute of Science and Technology (SkolTech) established in partnership with MIT, corporate R&D centres, business incubators, private seed and venture funds, and start-up companies, as well as residential space and social infrastructure. It is a city with over 30,000 residents and employees. CFE International specialises in strategic planning and organisational development. Through their expert knowledge they can empower organisations at a local level and the global marketplace. CFE international is highly respected for its expertise in fashion business development with a proven track record. Satisfied clients looking to develop their fashion sector include public and private organisations in Europe, Asia and the Middle East. They enable clients identify economic and cultural opportunities and provide solutions to act upon and develop through suitable platforms. As one of the fastest growing digital magazines writing about fashion technology and wearables, FashNerd.com’s foundation is based on the need to start an open conversation about the merger of fashion with technology. Founded January 2015 by Muchaneta Kapfunde and Mano ten Napel, this digital magazine is required reading for those addicted to the fashion tech, IoT and the wearable tech space. “FashNerd does not seek to shape opinions, we instead arm readers with the kind of knowledge that helps them approach the ever-evolving fashion tech space with an open mind”, said Muchaneta. Loomish provides digital investment consultancy services in the fashion and retail industry. Loomish advises on mergers and acquisitions within the ecosystem. Loomish offers an innovative opportunity for promising start-ups in the Fashion Digital Lab in Ticino. Innogest is a venture capital company founded in 2006 with offices in Turin, Milan, San Francisco and Berlin. It manages investment funds with a total value of €180 million and it invests in innovative companies active in the digital and and medical sectors, with a focus on seed and early stage ventures. With regard to the digital practice, Innogest has developed specific expertise and track record in the foodtech, fintech and fashion-tech fields.